This is a ready made lesson plan for teaching ESL with reading, vocabulary and idioms for advanced English students. A free downloadable printout is available at the bottom of the page. If I were you, I would …. Print out the article ‘How to Improve your Memory’ from the following website: http://www.helpguide.org/life/improving_memory.htm. 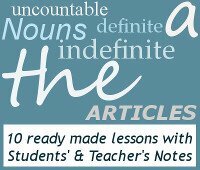 Cut up the article into its various categories (Tips 1 to 5, Mnemonics, Tips for enhancing your ability to learn and remember), and distribute them around the class. The students need to read through their section and then feedback to the rest of the class. and then get the students to ask each other questions using the collocations. Cut out the idioms with their definitions from the downloadable prinout. Give each student an idiom with its definition. Make sure all the students understand their idiom and explanation. They then need to think of a mnemonic or memory technique that they read about earlier in the lesson that would be suitable to help remember their idiom. They are then going to teach the other students their idiom, as well as a useful way to try and remember it. Once the class have been taught all the idioms, get them to draw them on the board for the other students to guess the idiom.